The Republican Party has for decades struggled with a public image - an inaccurate and even slanderous one, I will note - that it is an organization bent against the rights of minorities, women, pretty much anyone not Anglo-Saxon Protestant. 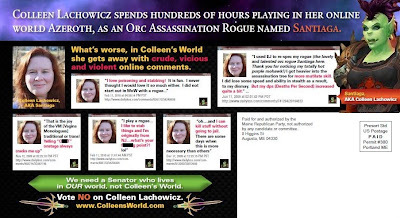 And then the Maine Republican Party messes it all up by coming out as anti-Orc Assassins. 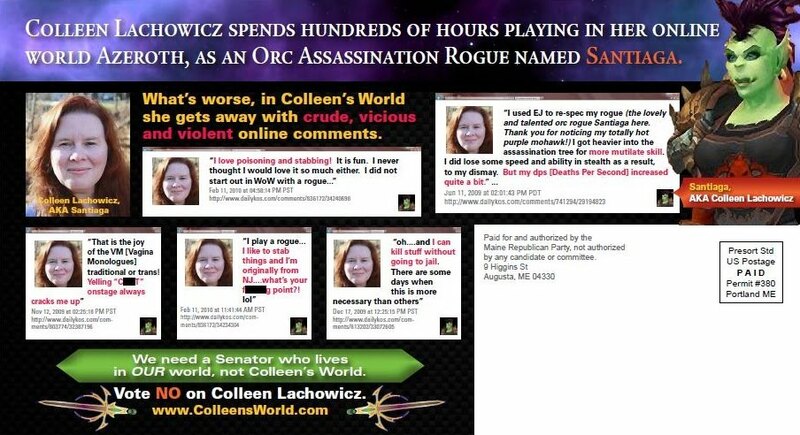 Maine state Senate candidate Colleen Lachowicz is being accused by Maine Republicans in an official campaign release as leading a "bizarre double life" as Santiaga: a cutthroat with green skin, mohawk and fangs. The thing is, "Santiaga" is Lachowicz's avatar in the crazy popular online game World of Warcraft. So now attacking a candidate's hobbies is considered an acceptable political tactic? This is a whole new low, one that the Republican Party should not only be ashamed of but thoroughly ridiculed for.